The Moon’s orbit is tilted by approximately five degrees compared to the Earth-Sun plane. The net affect of this is that the strength of Lunar-tides at a given latitude on the Earth’s surface vary in strength over a cycle of 18.6 years. This 18.6 year Draconic cycle is also clearly evident in the small changes that take place in the rate of rotation of the Earth. 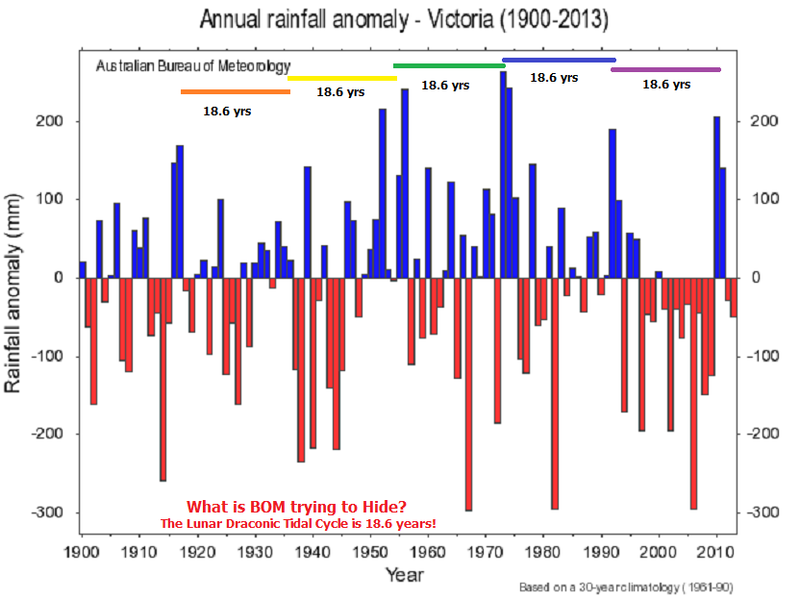 Why is the Australian BOM ignoring this obvious piece of evidence that connects the annual rainfall in Victoria to long-term changes in the Lunar Tides? Will they be ready for the next period of increased precipitation around 2029? I’m not seeing H.C Russell’s 19 yr Lunar drought cycles in there though. The 18.6 year cycle looks to be a subcycle of a larger cycle. 60 year? The clockwork universe reveals itself one wheel at a time. Doug, yes, the ‘triple Saros’ has a basis in resonant harmonics. Oldbrew will be along to explain. Thanks for the re-post of one of my blog posts. There are many others before me here in Australia who have notices the lunar connection to rainfall and surface temperatures in south-east Australia. They include H.C. Russell (the 19 years is not that much different from 18.6 years given the limited time span and poor quality data used by Russell), the father and son pair Lennox and Hayden Walker, Indigo Jones, Kevin Long of Victoria, Australia, just to name a few. The big question why does the Australian Bureau of Meteorology (BOM) ignore this obvious link? Reminds me of the Lake Eyre inflows we’ve discussed before. I prefer to stick with the 18.6 explanation because it has a logical underpinning with the observed 9.3 year variation in mean latitude of the sub-tropical high pressure ridge over eastern Australia. Variations in the mean latitude of the sub-tropical high pressure ridge are know to directly effect rainfall in South-Eastern Australia. Ian, is the time series really long enough to distinguish with certainty between 19 & 18.6 (9.5 & 9.3)? ” The 18.6 year cycle looks to be a subcycle of a larger cycle. 60 year? The clockwork universe reveals itself one wheel at a time.”. I wonder why 1936 it didn’t happen? As to why BOM don’t research this.. The 1930s were exceptionally dry elsewhere too. Yes, the time sequence is plenty long enough because you can actually follow the 18.6 year pattern in floods along Australia’s east coast all the way back to 1792. 19 years does not fit the data. Ian: Is it concievable that flood goes with nodal cycle and drought goes with the 19 yr Metonic cycle? Or is H.C. Russell just wrong? Given what the Metonic cycle is composed of, it would be a luni-solar effect wouldn’t it? H.C. Russel data set was only half the length of the current data set and it is much less accurate than the instrumental data of the 20th century. He had no way of differentiating between 18.6 and 19 years. With a much long data set (with higher quality data in recent years) it is now evident that the 18.6 year periodicity is the one supported by the data. The dates of major floods in the Brisbane River Valley compared to predicted 18.6 year cycle starting in 1825. [N.B. The above table does not account for all of the floods in the Brisbane Valley. If the period used for prediction was the 19.0 year Metonic period then 1974 floods in this sequence [working forward from 1825.0] should have occurred in 1977. The Metonic cycle of 19 years is just the time required for the Lunar Synodic cycle to realign with the seasonal calendar i.e. New/Full Moons occurring at the same time of the year. (with a small additional effect when the lunar line of nodes is aligned with the Sun, as well). So you would should be looking for periodicities that occur when the lunar line-of-apse (i.e. perigee) and the synodic month align with the seasonal calendar – preferably some time near perihelion. This would favor the 31/62 year period and to a lesser extent the 18 year Saros eclipse cycle. In addition, if you think the declination of the Moon plays a critical role influencing the effects of lunar tides upon climate [because of the differential effect of lunar tides with Earth latitude] then your more likely to favor the 18.6 Draconic cycle as a more important factor. So Ian, are you of the belief that we’re seeing LNC (18.6) in IPO? No Paul, we are seeing LNC in the rainfall in Southern Australia. My hypothesis is regional. What you are saying about the QBO and IPO is probably right on a global scale but it doesn’t specifically apply to the total rainfall in South-Eastern part of Australia. My point is that the Australian Bureau of Meteorology is totally ignoring the effects of extra-terrestrial factors upon climate, whether it be regional or global. A spectral analysis has been done of the long-term oceanic lunar tides along the west coast of Australia. The dominant frequency in the data South of ~ 30 degrees latitude is the 18.6 year Draconic signal, while north of this latitude it is the 8.85 year Anomalistic (perigee) signal. Of course, there is a transition between the dominant frequencies as you move from south to north. The same transition in dominant frequencies can be seen in the mean sea-level atmospheric pressure data as you move from the atmosphere over the Southern Indian ocean to that over the Northern Indian ocean. At high latitude.s the dominate factor affecting variation in the atmospheric tides is the LNC, while nearer the equator it is variations in the perigee distance of the Moon above the Indian ocean. So do you feel confident Ian , to predict the next Brisbane flooding based on the 18.6 yr cycle? Cancelling the carbon tax with conditions is the proposal..
Whatever is going on in Oz. is deep, takes a lot of reading and watching carefully. GWPF are posting heavily on this. Need read the small print and see the walk. Tim. Post coming up. Needs editing to add the Gore dimension. I have already made a prediction the summer will be significantly wetter than normal in the SE Australia in 2029 +/- 1 year. I have place a submission before an Australian Senate Committee stating this prediction. Vecchio, A.; Capparelli, V.; & Carbone, V. (2010). The complex dynamics of the seasonal component of USA’s surface temperature. Atmospheric Chemistry and Physics 10, 9657-9665. • […] the motion of the Earth’s axis due to the nutation, by affecting the insolation, can continuously perturb the climate system. • […] we found that the local intermittent dynamics is modulated by a periodic component of about 18.6 yr due to the nutation of the Earth, which represents the main modulation of the Earth’s precession. • The relationship manifests itself through occasional destabilization of the phase of the seasonal component due to the local changing of balance between direct insolation and the net energy received by the Earth. • The amplitude and phase variability of climate, which we call “season”, is determined by the competing action of the direct insolation, having its maximum at the perihelion, and the net radiation received by the Earth, having its maximum at the summer solstice. • […] in terms of the variation of the insolation due to the nutation of the Earth. Previous papers, analyzing different climatic datasets, do not clearly indicate whether the bi-decadal periodicity is related to the variation of the insolation due to the nutation of the Earth and/or lunar tidal forcing. 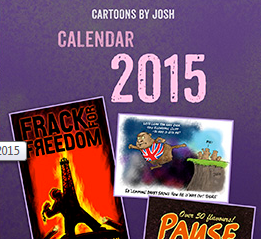 Tim Channon has previously done work on the anomalistic year and so might find the preceding interesting. Coupled with comments I recall from John S. at Climate Etc. (one of the rare few sensible commentators there) about regional advection versus local thermalization, it looks to me like a suggestion to concentrate on balances of influences of different types of years (anomalistic & tropical) across steep gradients, such as those that exist annually in the winter hemisphere. The location of these gradients is not independent of sunspot integral and changing solar cycle frequency modulation. Rial, J.A. (2004). Abrupt climate change: chaos and order at orbital and millennial scales. Global and Planetary Change 41, 95-109. • […] the climate system transforms amplitude modulation of global temperature into frequency modulation of global ice extent. • […] the mechanism responsible for FM is the result of the climate system transforming the amplitude modulated astronomical forcing into frequency modulation. • Extracting the astronomical signal from the paleoclimate data has required two steps: frequency demodulation followed by the application of Eq. (3), which is essentially equivalent to phase demodulation. The paleoclimate data requires such treatment because it appears to be doubly modulated, with the modulating signal itself a modulated carrier. Coincidentally, double frequency modulation, or DFM, is a signal processing method commonly used in telecommunications (especially in satellite telemetry systems and wireless telephony) in which the sum of a number of modulated sub-carriers is used to frequency modulate a higher frequency carrier (Cartmell, 1990). This process efficiently handles multiple channels carrying very diverse types of information, so it is tempting to speculate that this is why it has been naturally selected for transferring astronomical signals into the climate system.